Most consumers go through different stages of awareness, interest and attraction before finally making their decision to buy: their ‘customer journey’. Understanding these steps and how to pitch your messages and communications will make all the difference to your chances of success. Your customer has just discovered your brand. They’re curious, but they’re not interested in making a purchase yet. Trying to actively sell to them at this stage isn’t a good idea. Instead, you want to capture their imagination, and tell them the story of your brand when they are at the beginning of their customer journey. A Promo video. It’s a powerful way to launch new products and generate excitement about your brand – without appearing too overtly ‘sales-focused’. Your customer is engaged, and now they’re ready to find out more. They want to get to know your business – your products, your services and your ethos. A Talking Head or Explainer video. A talking head video lets them see the face behind your brand, and provides the human touch. An explainer video outlines key aspects of your products and services in more detail – creating interest, excitement and anticipation. Your customer is now comparing your products and services to the competition. You need to prove that your business is the one that can solve their problem. Seeing is believing – and your video can help achieve this. A ‘How To’, Demo or Training video. It’s your chance to show them exactly why your product is the best, and demonstrate that it’s exactly what your customer is looking for. The customer journey may mean they want reassurance before committing to buy. Your video content gives them the peace of mind they’re looking for – convincing them they’ve made the right decision. A Customer Testimonial video, Product Review or Case Study video. If you’ve had happy customers in the past, now’s the time to let them speak. Use their glowing testimonials to reinforce the message, or use a product review to explain exactly how the product works. These videos, unlike the previous stages, are designed to convert. They’re also short and simple – which makes them cost-effective to produce. If you feel your customer needs just a little more persuasion, a video at the conversion stage is an effective tool for closing the sale. A Customer Testimonial video or Special Offer. Create a sense of urgency and excitement, whilst emphasising the quality of your products and services. Your customer has completed the sale – but how to turn them from a one-time buyer to a loyal repeat buyer? A well-positioned video can help. A Live Demo, Training video or a FAQs video. Show your customers how to get maximum value from their purchase, and answer any questions that they might have. This shows that you aren’t just focused on closing the sale, but want to offer great customer service too. Great article! 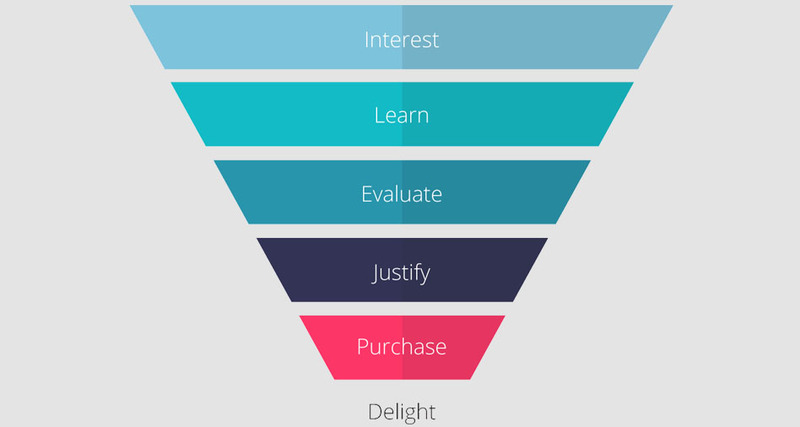 Not only do you explain the sales funnel, but you give a video example for every step of the customers journey. Awesome! Thank you Reg! Of course those examples are just drawn from our experience, but videos are very versatile! Do you have any different suggestions? Would be great to get some different opinions! One of the great things about video is its versatility. I’m a big fan of using Customer Testimonials in any stage of the sales process. It is especially good at busting objections if you can pre-frame the testimonial. For Stage 6, I would recommend a Thank You Video, that reassures the buyer after the sale as well as pointing to other video resources for them to get the best out of what they bought. It is good to create that warm fuzzy feeling after a sale, as the article said, it isn’t all about closing the sale. Thanks. Completely agree! The beauty of testimonials is that it can be used in the early stages of the journey but can sometimes be all that is needed to get the customer to purchase! The ‘thank you’ video is also a great idea! I think it’s very underused but definitely worth doing! After all, it encourages repeat custom which is every marketers dream, right? !